Ketchikan’s humidity and dampness is the perfect breeding ground for bacteria and yeast to grow in your dogs’ ears. 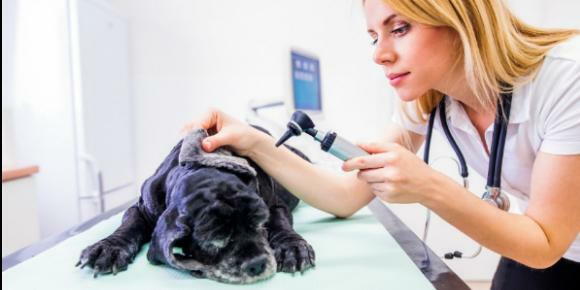 Add ear wax, dirt and water and your dog is on his way to a full-blown case of stinky ear gunk. Without proper cleaning, dirty ears can soon become an infected ear. Dogs that have floppy or furry ears are more prone to holding in the moisture and warmth. When the ear wax and dirt build up, with Ketchikan’s wet environment the ear canal becomes an incubator for bacteria and yeast to grow. If left unchecked, it can lead to inflamed, red and painful ears. Symptoms include excessive head shaking, scratching and may even wince if you touch his ears. Seek veterinary treatment right away if your dog is exhibiting any of these symptoms. There is often a foul smell that signals an ear infection is brewing. If your dogs’ ears smell gross, you are overdue on cleaning. There are many ear cleaners available over the counter that can help keep your dogs ears clean and pain-free. We at Island to Island Veterinary Clinic can help show you how to flush out debris, if you are unsure. Working one ear at a time, administer a small amount of ear solution into the ear. For dogs that are more sensitive, you can also moisten a cotton pad with the ear solution& then squeeze the solution into the ear. Massage the base of the ear to loosen up the debris. Most dogs really enjoy the ear massage, but beware as soon as you are done, a vigorous head shake will follow, along with flying gunk. Wipe the ears with cotton pads, being careful not to push the gunk down further. We also offer an ear flush and hair clean out if you prefer full-service ear cleaning. Call to set up an appointment, and your dog will walk away feeling much better! Either way, make a habit of checking ears and clean as needed as part of your pets hygiene routine.